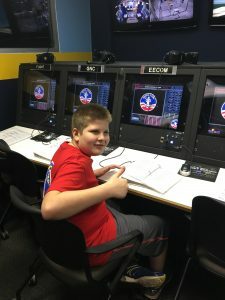 The first part of our Spring Break extravaganza involved a 48 hour program at Space Camp in Huntsville, Alabama. We went as a family, with my daughter’s Girl Scout troop, and I can honestly say it’s one of the best things we’ve ever done together (which is kind of saying a lot). The Pathfinder program is designed for groups of 4-8th graders – we had 3 4th grade boys, and 6 6-7th grade girls. It was a PACKED schedule, our only downtime was during meals. The 4th graders slept HARD each night, and it was a little much for them, but for 6-8th graders, I can’t think of a better hands on STEM program. Our group did a simulated space mission, where each crew member was assigned a job and read the script for that position. I got to conduct an experiment on the International Space Station, which my husband commanded. 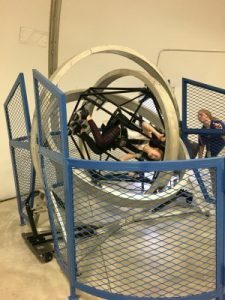 My son was in Mission Control, and my daughter got to do a space walk. 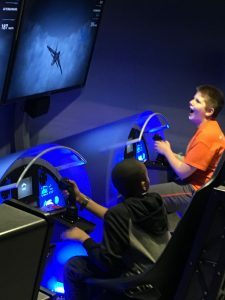 We experienced simulators, built rockets and learned the history of the US space program. We also learned about what it’s going to take to get to MARS, and how the US is planning on getting there in the next 10-15years. The Pathfinder program stretched our minds to think outside of our midwestern lives, and to think actually out beyond the stars. My kids haven’t stopped talking about it – about how the Mars teams are working on being earth independent and how long that journey will be. The Fox is already talking about going for a longer program in a few years, and if we can get him there, we absolutely will. This is known as the vomit comet, but it actually doesn’t make you dizzy. Have a problem? Houston can help. Flying a fighter jet he designed. We graduated with the other Pathfinder Missions taking place that weekend. Huntsville is an easy day’s drive from Indianapolis, and it makes a great long weekend destination. The US Space & Rocket center is worth a visit, even without attending a Space Camp program. It’s currently a member of the ASTC travel passport program, which means members of the Indiana State Museum receive free admission, which makes it even better! 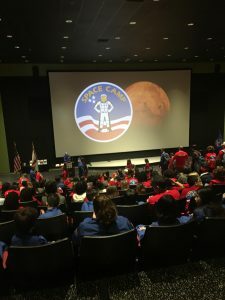 Who knows, maybe one of the kiddos we attended with will get to Mars one day!! We have reached the mid-point of summer break- time is just flying! After recovering from the boy’s birthday bash, we were ready for another adventure. Some years,we take BIG trips (NYC! Disney! Smoky Mountains!). Other years, we keep it local. This year is officially the year of the one-tank getaway. Where, oh where in Indiana can we go on one tank of gas? Our welcome package. 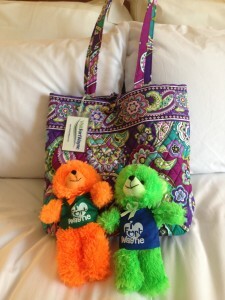 Tangerine and JackO’Lantern came with us everywhere! For Wayne is just under two hours away (from the NE side) from Indy. This means we didn’t even have to make a pit stop on our way there. Fort Wayne is easy to get around- we stayed at the Hotel Fort Wayne, which is right off the highway, and pretty direct access to downtown. Everything we needed was 10-15 minutes away. Downtown Fort Wayne looks like a downtown- there are tall buildings and what not- but it’s easy to navigate and parking was a breeze. What kid doesn’t love a hotel? 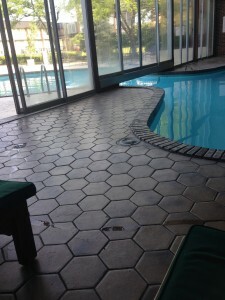 I’ve been reading all kinds of accounts of summer fun, and just about everyone comments on how much kids love hotel pools and hotel beds and hotel television. Our kids are no exception. They pretty much wanted to move in to the Hotel Fort Wayne. Our hotel room was a double, and we were comfortable for the night. The conceirge level was closed the day we were there, but we were provided with some in room snacks, and breakfast from the restaurant the next day. We didn’t spend much time in the room on Tuesday, but Wednesday morning we went to the pool after breakfast. After checking into our hotel, we headed to Science Central. This hands on science center was a great time- both kids really enjoyed all of the activities. MaM “walked on the moon” and both kids had fun trying to beat their times on the Giant Slide. Leilan was brave enough to try the elevated bike ride as the rest of us cheered him on. There’s also a spot for kids 7 & under that includes a water table, which was a huge hit with my 7 year old! 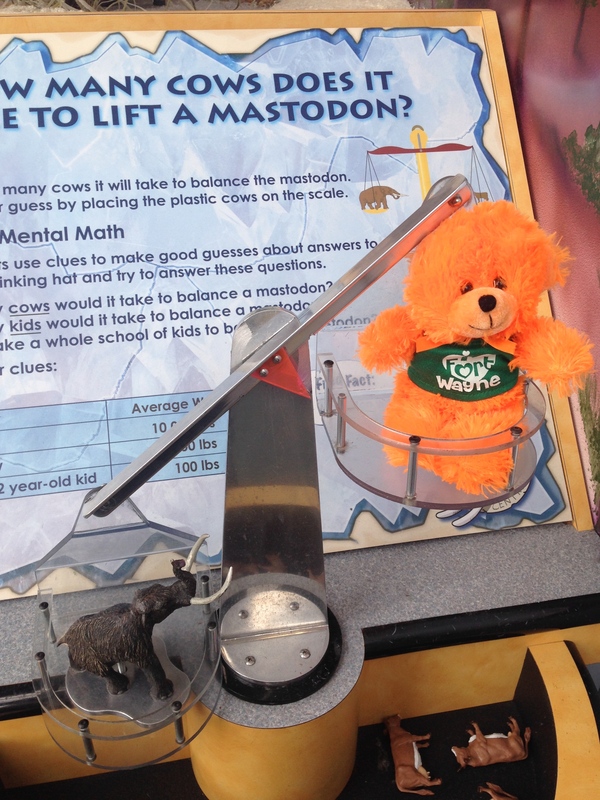 I’ll be writing more details about Science Central on Indy with Kids in the next couple of weeks- stay tuned! 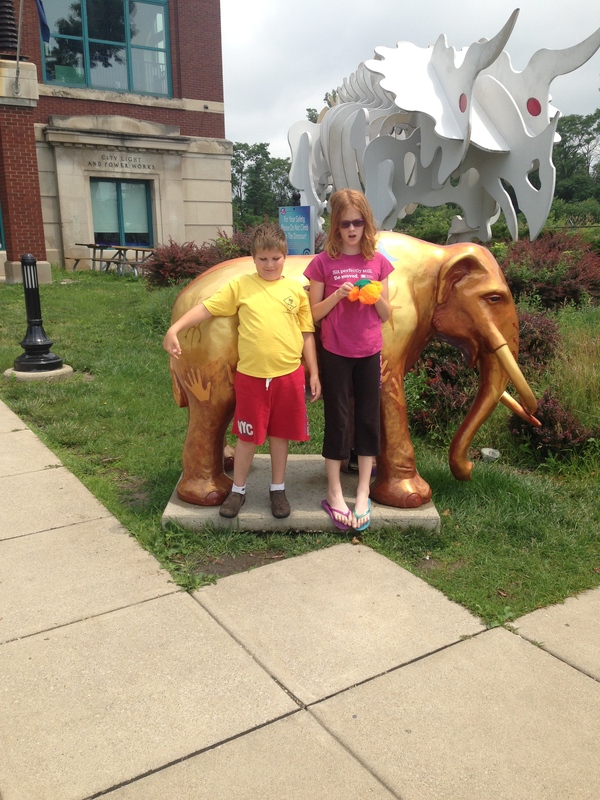 We headed downtown after Science Central. The art museum would have been a quick stop had it not been for the early childhood room there. The galleries had some interesting pieces, but it was a five minute walk through at most for the kids. We spent over an hour in the early childhood room, however, which made the trip worth it. The kids had fun building with all kinds of blocks, and drawing on paper and a dry erase wall. We headed over to the legendary hot dog diner before the Tincaps game. 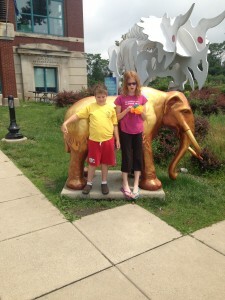 The Kahuna kids love a good counter restuarant, and Fort Wayne’s Famous Coney Island Weiner Stand did not disappoint. Coney dogs, hamburgers, and plain hot dogs were ordered, and we all enjoyed. The staff was incredibly friendly and we really enjoyed the meal. The menu is very limited- burgers, dogs, chili, chips and drinks. From there we walked to Parkview Field for the Tincaps game. Every summer we try to make it to at least one baseball game, and I was glad we were able to branch out from our usual hometown team. 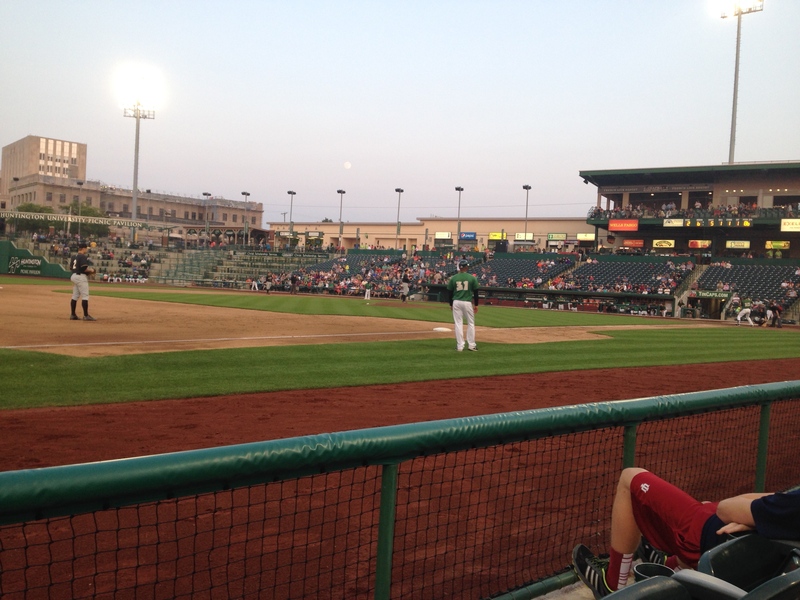 Parkview Field is known as a great baseball field, and after seeing a game, I can see why. We were able to get seats right on the third baseline, and watch the opposing team’s pitcher warm up. Even from third base, it was easy to see home plate and first base. There was entertainment between innings, and plenty of crowd-participation activities. The kids also really enjoyed the Kid Zone, where they both kept busy for about thirty minutes before the game started. For $10, they each got 6 tickets to spend on bouncing/inflatable attractions, and they had a great time. 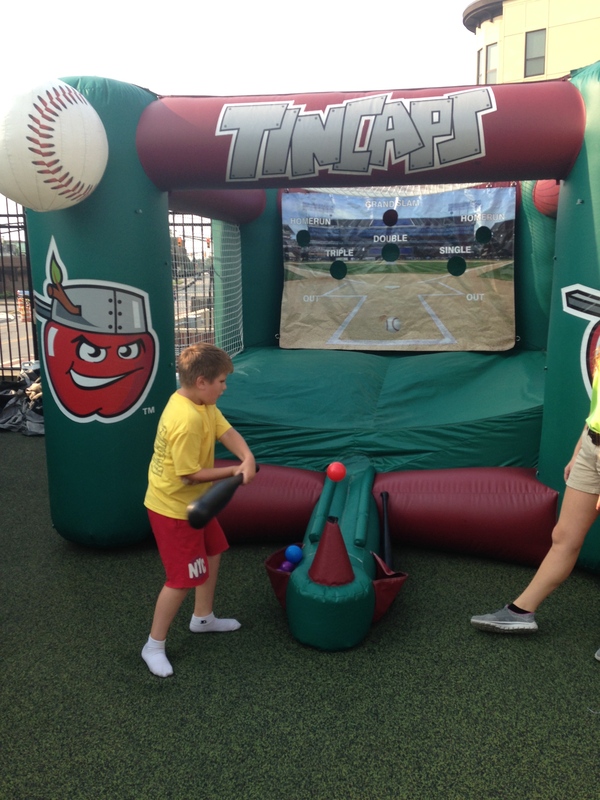 We enjoyed some snacks, and cheered the Tincaps onto a win. An added bonus: Parkview Filed is open daily as a walking track to the general public. What a great use of a community space! This zoo is amazing. I am so glad we finally got there after about five summers of saying, “We should really go to the Fort Wayne Zoo.” The parking is easy, and everything about the zoo is set up for families. Want to bring in your lunch? Fine. Need to push a giant triplets stroller? Fine- it should fit everywhere. Need a bathroom or a water fountain? They’re everywhere. And all of the animal displays bring you up close to the animals. During our visit, we were just one glass pane away from a lion, with in arm’s reach of penguins, and close to many other animals as well. There were so many animals, including colorful birds and all kinds of monkeys. 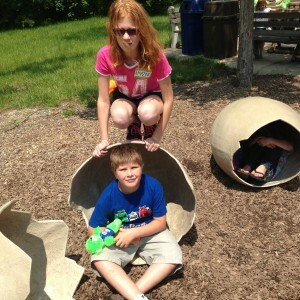 We spent about four hours at the zoo, and could have spent more- we definitely didn’t see everything. I highly recommend taking some time to explore Fort Wayne. It was an easy trip, and the kids want to make plans to return. Several times during our trip, the kids commented, “This is fun!” “What a nice day!” “Can we come back here soon?” There are plenty of parks to explore, more eateries to experience, and attractions to see. There are plenty of locally owned restaurants, and blocks to explore downtown. Disclosure: Thanks to Visit Fort Wayne for coordinating our trip!